Last week a new Twitter based app was released by @shobankr called Tweet My PC. This is a great app as you can Restart, Shutdown or Logoff your PC using your Twitter Account. This means that you don't even need to be in front of your computer to switch it off. Just tweet from your mobile and your PC will shut down. We can even use this app to play pranks on other people by Shutting down or restarting their PC without their knowledge. Its totally upto you, how you would use this app. The best thing about this app it that its very small, just 382 KB. So you don't need to worry about it taking space and consuming the PC resources. When you install this app, it will appear in the system tray. You can see the Tweet My PC icon in the system tray. Just double click the icon to open it. When you open the app, you will see a small box which asks for your Twitter id and password. 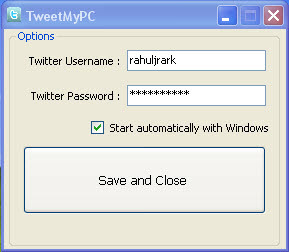 Enter the id and password of the Twitter account which will be used by Tweet My PC to monitor your tweets. When you click on Save and Close , Tweet My PC takes some time to verify your account. When the account has been verified, you can tweet Shutdown , Restart and Logoff to perform the respective action. The commands are Case Sensitive. So if you tweet shutdown or restart , then nothing will happen. I have tried this app and I tweeted Restart. Within a minute of the tweet being published, I saw a window with 2 minute Countdown Timer asking me to save all the work I was doing as the PC was going to Shutdown. I find this app very useful as I can control my PC even when I am not at home using my Twitter account. Now that Twitter has become very popular, many new apps based on Twitter are coming up. We can expect many more useful apps which use Twitter in the future. 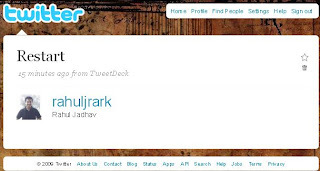 @shobankr has added some great features to Tweet My PC which make is even more intresting. Visit Code Geeks to read the post.